It is with sadness that we have to report the death of Charles Kennedy, 8th Marquess of Ailsa. He was born on September 13th 1956, and died while attending the Florida Highland Games at Altamonte on January 15th 2015. As well as being the 8th Marquess of Ailsa, he was also 19th Earl of Cassilis and 8th Baron Ailsa. He also held the title of 21st Lord Kennedy. 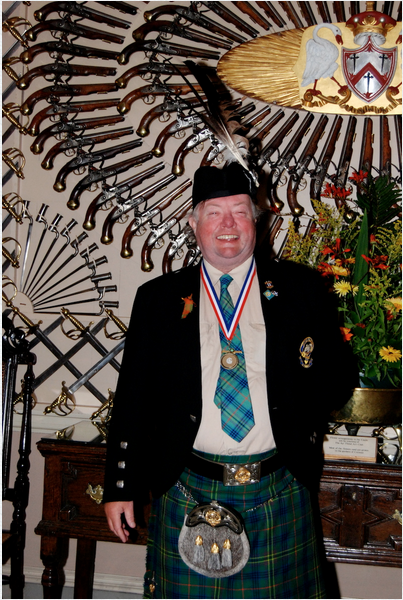 Although his death was unexpected, his family believe it was fitting that the Marquess passed away, kilted in the Kennedy tartan, while leading a gathering of Clan Kennedy in Florida, doing ‘what he loved most.’ He he lived close to Culzean Castle, the Clan Kennedy family seat which was handed over to the National Trust for Scotland. The Marquess of Ailsa is survived by his daughters Lady Rosemary and Lady Alicia-Jane, and by his brother David, who becomes 9th Marquess of Ailsa, and Chief of the Clan Kennedy. A fuller obituary can be found here. It was a chilly morning on the 9th September 2013. It was, we understand, a chilly morning 500 years earlier. Then, the day would bring a sea of blood and the greatest catastrophe ever suffered by Scotland. Now, the day brought a solemn commemoration of the battle that ripped out the best of Scottish governance, vision and society. The service was two years in the making and we had enormous support. From the Minister of St Giles’ Cathedral to Isla St Clair, from the New Club in Edinburgh to Maxwells who donated the flowers, everyone was behind the enterprise. The earliest of decisions was to make sure that the service would not be misconstrued as some strange ‘celebration’ of the disaster. So, we set out to raise money for two contemporary Scottish charities that look after soldiers who are damaged in current conflicts. We chose Combat Stress and Erskine. Energy company EdF and auction house Bonhams sponsored a reception after the service, so that all donations could go straight to the charities. We raised over £25,000 for them. The service itself was beautiful. It was solemn, with stirring songs and sad, with Flowers of the Forest sung with extraordinary beauty by Isla St Clair. It was also a reunion, with over 40 chiefs gathering to commemorate ancestors (such as my own, William, 3rd Earl of Rothes) who were lost. As such, it was, ultimately, an upbeat affair. When dawn broke on the morning of 10th September, 1513, the landscape of hell was revealed. On the gently undulating northern ridges of Branxton Hill more than 10,000 men lay dead or dying. In the midst of the carnage were the naked, plundered bodies of King James IV of Scotland, his half-brother, Alexander Stewart, Archbishop of St Andrews, George Hepburn, Bishop of the Isles, two abbots, nine great earls of Scotland, fourteen lords of parliament, innumerable knights and noblemen of lesser degree and many thousands of farmers, ploughmen, weavers and burgesses. It was the appalling aftermath of the battle of Flodden, the greatest military disaster in Scotland’s history. At the same time, James IV was about to make a catastrophic decision, a crucial error of judgement. Instead of occupying an elevated position at the rear of his vast army, he chose to lead from the front. His division raced down Branxton Hill and as they reached the lower slopes and much softer ground, many men began to skid and lose their footing. This unsteadiness made it very difficult for them to control their long, 12 foot pikes. The wet ground made them charge out of formation, only engaging piecemeal with the solidly planted ranks of English billmen, With their shorter, more easily handled bills, they began to slice into James IV’s division. And as the men at the back saw the Scottish pikes go down, they hesitated and many of them ran, believing their king to be killed. By leading from the front, James was immediately submerged in the ruck of the fighting, only able to see what was directly in front of him, in no position to direct his forces. The result was disaster. And the result was to be felt by generations. The only people left to Govern Scotland were children and old men. The service was a great success, money was raised for two important, charities and the profile of the Standing Council of Scottish Chiefs was raised, due in part to the extensive television and press coverage we received. The moment that I will long remember is when I saw a BBC television sound engineer behind a pillar waiting for Isla St Clair to sing Flowers of the Forest. We had told him before the service that she did not want to use a microphone. I could see him thinking ‘this is going to be rubbish, I bet I can’t use….’ and then he stopped as she began to sing and he looked up. And, I could not be sure, but I thought I saw a tear in his eye.